Arbor Day is a day to plant new trees and celebrate the many benefits we derive from trees. Springtime is a good time to have an Arbor Day celebration, but fall is even better for tree planting. But Arbor Day in your city, town, or village can be any day of the year that your community decides. Hold an Arbor Day celebration to honor environmental stewards in your community. Honor people or businesses who have initiated projects like establishing a tree planting or recycling program. Seek nominations from the community. Organize a "Big Tree" search within the community. Once the results are in, publish a brochure that lists the locations of the winners. Present the owners of the trees with a certificate at the celebration and conduct a walking tour. Ask the mayor to issue an Arbor Day Proclamation declaring tree planting as an act of stewardship. Recognize Tree Board members and city staff that help care for and maintain the community's trees. Plan the celebration around the proclamation and include poems, stories, quotes about trees, and a tree planting. 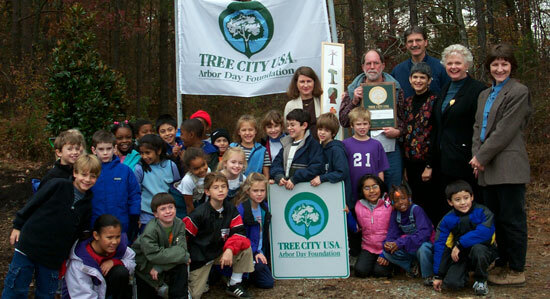 Encourage schools classes to have an Arbor Day Poster Contest. School and class winners can be displayed at the celebration, or print the winning poster on tee-shirts that are given to attendees. Host a workshop on proper tree planting, pruning and mulching, tree selection, and tree identification. Charge a small fee and use the money to purchase seedlings for the participants. Choose a park or downtown area that needs cleaning up and encourage residents to participate in a litter pick-up. Invite certified arborists to assist with pruning trees in the area, have school groups replace mulch around trees or plant flowers. Contact your NCFS County Ranger or municipality to learn how they celebrate Arbor Day, get involved or plan an Arbor Day Event.